The defending national champion Villanova Wildcats face the battle-tested Purdue Boilermakers in a 2019 NCAA Tournament second-round game on Saturday night at 8:40 p.m. ET. Both hard-nosed clubs come off low-scoring grinders in their first-round victories to advance in the 2019 NCAA bracket. Purdue, the No. 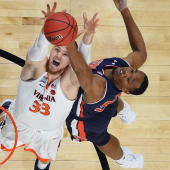 3 seed, defeated Old Dominion 61-48 on Thursday night, while Villanova edged St. Mary's 61-57 in its first-round game. Purdue is looking to advance to its third consecutive Sweet 16, while Villanova is seeking a third national title in the last four seasons. The Boilermakers are four-point favorites and the over-under for total points scored is 137 in the latest Villanova vs. Purdue odds. Before you make any Villanova vs. Purdue picks, check out the 2019 NCAA Tournament predictions from the SportsLine Projection Model. The model, which simulates every game 10,000 times, has raked in the winnings for those following its picks. Over the past two years, the SportsLine Projection Model has returned more than $4,000 to $100 players on its top-rated college basketball picks. It also entered the postseason on a strong 11-5 run on all top-rated college basketball picks. Anyone who has followed it is way up. Now, it has locked in on Villanova vs. Purdue. We can tell you it is leaning over, and it has also crunched the numbers and generated a strong against the spread pick that hits a whopping 60 percent of the time. That selection is only available at SportsLine. The model knows Purdue presents a formidable combination of experience, balance and size. All of those strengths played a part in its first-round win over Old Dominion. The Boilermakers were slow to get going offensively, but their defense was air-tight from the start and never relented. They built a 32-19 halftime lead and quickly extended the margin to 20 in the second half. They held the Monarchs to 26.9 percent shooting on 18-of-67 from the field and 24 percent from 3-point range. Purdue also held a 45-41 edge on the boards. Leading scorer Carsen Edwards battled through a sore back to play all 40 minutes and scored a team-high 26 points. Sophomore center Matt Haarms added 13 points, four rebounds and two blocks. But the Boilermakers will face a challenge to cover the Villanova vs. Purdue spread Saturday against a team that hasn't lost on a neutral floor since it was upset by Wisconsin in the NCAA Tournament two years ago. The Wildcats were believed to be in rebuilding mode after they lost four starters following their memorable run to the national title last year. They struggled in the early going and had some rough patches in a down year for the Big East. But Villanova responded when it mattered most and ended up with another double championship by winning the Big East regular-season and tournament titles. It has won four straight games and six of seven. In their first-round win, the Wildcats struggled to create separation from a surging Saint Mary's club that earned its NCAA Tournament bid by beating Gonzaga in the West Coast Conference Tournament final. Villanova survived by shooting an efficient 49 percent from the field and making a series of defensive stops in the closing minutes. Phil Booth led the way with 20 points and six assists. Who wins Purdue vs. Villanova? And which side of the spread hits in 60 percent of simulations? Visit SportsLine now to find out which side of the Purdue vs. Villanova spread you should be all over Saturday, all from the model that's up more than $4,000 on top-rated college basketball picks the past two seasons.